Marina Port Tarraco is a deep-water marina designed to provide superyachts with the highest quality services and offers 64 berths up to 160 meters. The marina provides absolute privacy and security protocols to ensure a warm welcome and personalized assistance to all vessels and also has everything that Superyachts owners, captains and crews require; a vast range of berthing facilities including 24hr security and CCTV surveillance, ISPS code complaint, shore power connections up to 1,600 amps at 400 V and 6,600 V / 2,000 VA electrical connection to giga yachts, waste pickup MARPOL certificate, fresh water, Internet and Satellite TV, berthing assistance on arrival and departure and exclusive customer service to ensure a comfortable stay. Recently, Marina Port Tarraco has been certified as an Authorized Economic Operator (AEO) by Tax Authorities to bring great advantages to their clients that certifies that a company’s role is more secure and that its controls and procedures comply with European Union customs regulations. Additionally, the marina offers a commercial and leisure area, with bars, restaurants, pubs and fitness club. During the summer season, the marina also hosts live concerts, entertainment and crew events all year round. The marina is well connected within Spain and to the rest of Europe. Strategically located close to the International Airport of Reus (10 min) and Barcelona airport (50 min). 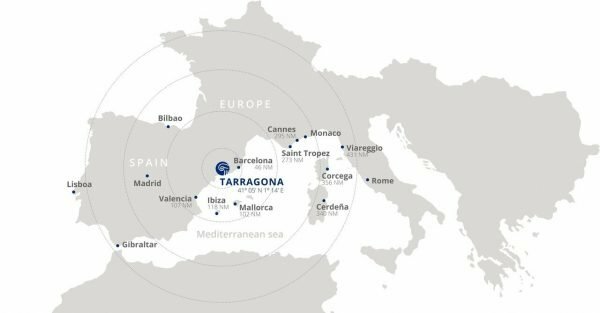 Is also located 500 meters from the city’s train station and 15 minutes from the high-speed train (AVE) that connects Tarragona to Madrid in less than two and a half hours.